Trim meat as desired, sprinkle with garlic salt and spread with some shop bought or homemade Oatmeal Pudding/Skirlie. Roll lengthways and pin with a cocktail stick. Put the lid on the casserole dish and put it in a very hot oven for 35 minutes. Take it out and cover with foil. Allow to rest for 15 minutes. Add some chopped shallot, celery and carrot to the casserole and fry gently, deglazed with red wine, redcurrant jelly and add some vegetable stock. 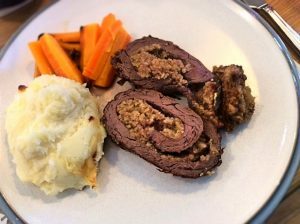 Serve with your choice of vegetable, suggestion: mashed tattie and butter baked herby carrots.